Showing this weekend at the Kingman Historic Theatre? is Mission Impossible Rogue Nation!! Aug 21-23 Fri-Sun all showtimes are the same EXCEPT SUN.SHOWTIMES FOR SUN ARE 5:30!!!!!!! 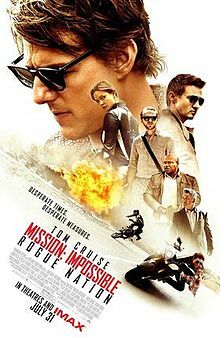 !This movie is rated PG-13 and stars Tom Cruise, Rebecca Ferguson, Jeremy Renner.